Link to your office phones, out of hours service or call centre. Voice messages transcribed & delivered via an API interface. Turn vast amounts of unstructured text into high quality data. Listening to voice messages can be terribly inefficient and laborious. 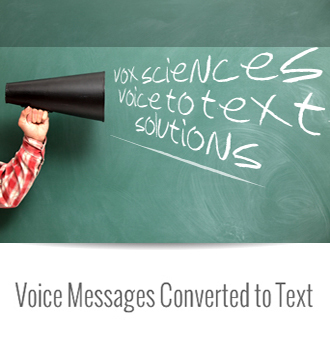 VoxSciences™ provides a paradigm shift by transcribing voice messages into text messages. This gives voice messages a quantum leap to join email, SMS and IM on an equal basis with all the inherent advantages such as textural search. Our VERBS (Virtual Engine for Recognition of Basic Speech) engine converts voice messages into text messages and delivers them either as an email, SMS or via an API interface. Voicemail to text (SMS) is ideal for personal or corporate voicemail systems. Voice messages transcribed and delivered via email is primarily used by call centres, comment or competition lines and corporate voicemail systems. Our XML API is typically used when a particularly high volumes of voice message transcription is required often by larger companies for Voice of The Customer analysis, comment lines, network or PABX operators and affiliates. Voice of the Customer is a market research technique that produces a detailed set of customer wants and needs. It involves the analysis of feedback from various sources such as email, web and IVR surveys. VoxSciences provides a key component in faciliting the analysis of audio feedback for analysis by providing near realtime, business grade transcription of verbatims via our API.